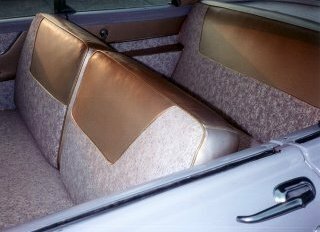 In 1955, when Dodge released the first La Femme model, Dodge took the standard Custom Royal Lancer interior and added a special "rosebud" cloth to the seats and door panels in order to create the special "La Femme only" interior. The next year Dodge went a step further and created a unique design for the 1956 La Femme. 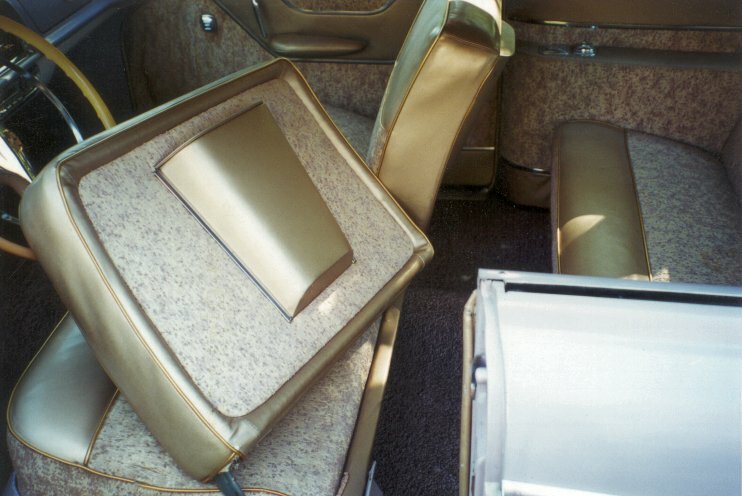 The seats, shown above, featured a similar treatment of "Orchid Jacquard" with "Gold Cordahyde" bolsters. The 1956 Dodge La Femme came with a specially designed, matching raincoat, rainhat and umbrella (See Accessories for more information). Carrying over the same design from 1955, Dodge included two special seat back "boxes" to hold these accessory items. Instead of relying on the normal seat, carpet, door and headliner patterns used in the 1956 Custom Royal Lancer, Dodge created a complete original and unique interior that was "La Femme only". 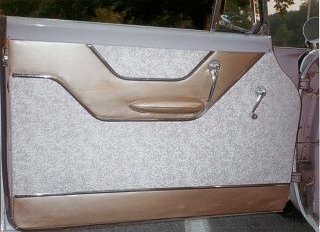 The carpet, shown at lower right, consisted of pink and burgundy woven throughout, similar to the "tuxedo" carpets seen in the early 1960's on Dodge Polara 500 models. The picture above shows the driver's side box. Restorers should take note that the 1956 boxes are DIFFERENT in size and shape from their 1955 counterparts. Even the steering wheel in the 1956 Dodge La Femme received a special two tone treatment. 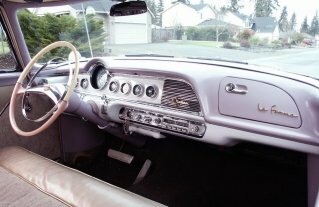 Dodge wanted buyers to make no mistake in 1956, the La Femme was EXCLUSIVELY DESIGNED for Her Royal Highness, the American Woman. In addition to the carpet, the headliner received a special "La Femme only" treatment. 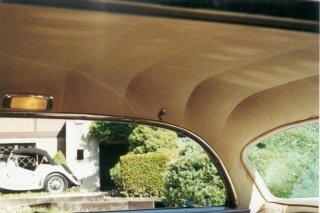 A Light Orchid headliner was flecked with gold "dots" throughout. The door panels, shown below, consisted of a special "Orchid Jacquard" fabric matched with "Gold Cordahyde" vinyl.